A follow-up on the presentation I did for ANUG a few months ago. I’m being interviewed by Søren Spelling and we have a friendly talk about this and that in danish. The other day I was looking through my backup drive and stumpled on a funny (like haha funny) thing I did a few years back. 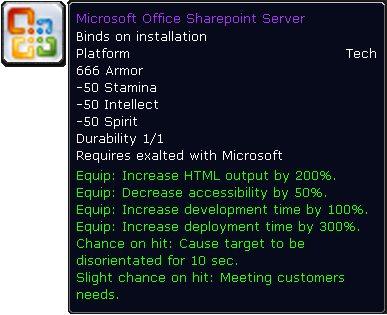 If you ever played World of Warcraft and at some point crossed paths with Microsoft Sharepoint, this is a laugh. So without further ado I introduce the MOSS of Fury. The other day I did a talk on structuring client code and getting more out of jQuery. 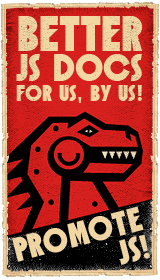 Target audience was ANUG and getting these .NET’ers up to speed on the world of JS. A good read for anyone into frontend development and there are loads of code samples and clever tricks ready to use in your next project. Also there are a few suggestions on how to get VS2010 up to speed when it comes to client side development.